A variety of unregulated economic activity has been occurring in the virtual world Second Life. In-world banks sprang up a few years ago and have experienced considerable volatility, mostly closing and reorganizing, for example the high profile collapse of Brazil-based Ginko Financial in September 2007. Some banks have extended their activities into in-world securities. Though eventually repealed in real life, Glass-Steagall provisions could be helpful in preventing conflicts in developing virtual world economies. There are at least three stock exchanges currently operating in Second Life, the SL Capital Exchange (physically based in Syracuse NY, USA) with 20 listed companies, the World Stock Exchange (physically based in Australia) with 15 listed companies and the recently launched Ancapex (physically based in New Hampshire, USA) with three listed companies. There is even a Second Life Exchange Commission to provide standards of performance, operations and ethics for in-world market participants. Listed companies have not provided detailed financial statements (much less third-party audited financial statements), have not indicated a dividend policy and do not have RL (real life) professional CFO/CPA personnel. A prospectus is sometimes provided (example) and the RL's CEO name and location may be optionally provided. Considering offering and purchasing activity in the U.S., the stocks do not appear to qualify for any U.S. securities registration exemptions. The only nod to RL securities laws is a disclosure at SL Capex, claiming that the securities are a fictitious simulation, however given the easy conversion of Linden$ to USD and legal precedent in this situation, it is likely that the Second Life activity would be deemed securities issuance. Are the SEC in the U.S. and other corresponding national securities regulators likely to take an interest or is the issuance too small, the venue too novel and the cross border challenges too great? If there is enough $ value of harm incurred by investors, an investor could file a complaint. But to whom? To securities authorities in their country, to Linden Lab, to the securities regulator of the exchange or listed company, to the Second Life Business Bureau or other in-world adjudication bodies? While creating virtual world analogs to those in the physical world is to some degree laudable, the attempts might be ultimately more successful by incorporating a greater balance of physical world regulation and protection mechanisms to build a sustainable ecosystem. Analysis of the future of security, warfare, freedom, surveillance and privacy generally occurs under the biased assumption that today’s security regime will persist. The current paradigm is that existing controls, rules, regulations and laws are generally accepted, but will always have loopholes, hacks and breaches. In fact, security in the future may include scenarios of both weaker and stronger control regimes. The current and recent historical economic regime also may not be the only possible future. The current model is some form of capitalism, that resource allocation is uneven per initial standing and ability level; those who start with more resources most often end with more too. If market forces become thousands of times more powerful than today's monopolies, what incentives will be appropriate to employ to create market persistence and effective resource allocation? 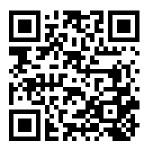 What about a resource that is essentially free but very powerful (say upload processing power). The future may have a variety of capitalist and socialist market mechanisms. In the future, all manner of current and historical social, political, economic, regulatory, legal, etc. regimes should be considered as continua of greater or lesser rigidity which are likely to be co-existing simultaneously. Exemplifying the electric growth of Web 2.0 companies, the virtual world Second Life has grown from under 1 million residents to over 10 million in a little over one year. While 10 million residents is perhaps not the best measurement metric for the world’s success (users may have multiple resident accounts and not more than 10% of them so far do anything more than have one quick look around), it is still an important milestone. 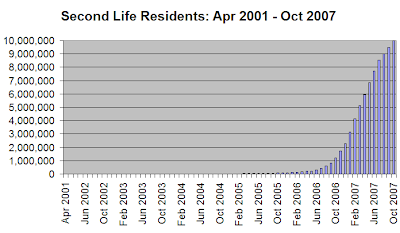 Other Second Life indicators reflect vigorous health, for example, a robust economy exceeding $1 million USD per day and a routine concurrency (the number of residents in-world at any time) of 30,000-40,000 with a new peak concurrency of 50,000 reached for the first time in early September 2007. Other statistics are available here. The virtual world space is itself burgeoning, with 10-20+ worlds now available or about to launch targeted at different age segments (pre-teen, teen and adult). Second Life, There, ActiveWorlds, Multiverse and Kaneva are the best known, several of whom are coming together to develop standards for avatar, object and economic transfer between worlds. Another growth indicator is the industry gatherings, the second meeting of the Virtual Worlds conference, Oct 10-11 in San Jose CA, attracted over 1,000 attendees, nearly doubling from the first conference. The third annual volunteer-run Second Life Community Convention, Aug 24-26 in Chicago IL, also attracted a crowd of about 1000. Perhaps most exciting is the broad audience and variety of applications that virtual worlds are attracting; entertainment, enterprise, education, non-profits, governments and individuals are all exploring the medium amidst a flurry of both positive and negative press. Groups of every sort are coming to virtual worlds to collaborate in richer ways than have been possible previously. For example, below is a sim featuring LAX airport traffic data visualization. Some innovative solutions are needed with increasing medical system pressures from aging populations coupled with an elucidated understanding of the medical process, that medical mistakes occur about a third of the time, mainly due to cognitive error. What about a Web 2.0 company, SecondOpinion.com for example, where patients, having obtained electronic copies of their medical imaging data (X-rays, MRIs, etc.) post the information to the Internet community, appealing to the collective intelligence to seek whatever experienced or inexperienced opinions can be obtained, Wikinomics-style. The SecondOpinion.com community members interpreting the data would probably be in four groups, doctors and medical students, information experts interested in applying their pattern-matching models to novel data sets, other patients with similar conditions and those without any medical expertise. The patients or site users would post their data anonymously via web handle, entering information that could include current prescriptions, full histories and eventually DNA scans. MyMedicalRecords.com could become the primary repository of personal electronic medical records, a universal human health database; patients could give new doctors their handle to review and add to their history. This opt-in patient-driven rather than physician, insurance or medical-system driven mechanism promotes progress toward effective solutions while sidestepping onerous HIPAA and legal, ethical and privacy issues. Those that feel uncomfortable need not participate. A successful example of opt-in handle-anonymized personal data posting exists at Prosper, where 440,000 loan-seekers have agreed to have their credit histories posted publicly. Another positioning of the concept is the serious video game, InterpretMyXray.com, where players (medical students and the general public) could go through a learning module and then be rewarded for correct diagnoses. The most accurate and top reputationed Xray interpreters might not be medically trained professionals, or perhaps even human. The quality of the interpreted results would be interesting to see, the assumption is that many eyes, other skilled professionals and the wisdom of crowds might spot something important or bring a consistency of interpretation. Of course SecondOpinion.com and InterpretMyXray.com would not immediately replace traditional medicine but supplement it as a second opinion resource and mechanism for patient education.